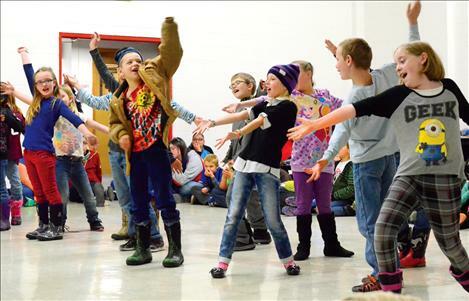 Children speak loudly during Missoula Children's Theater auditions in Arlee. 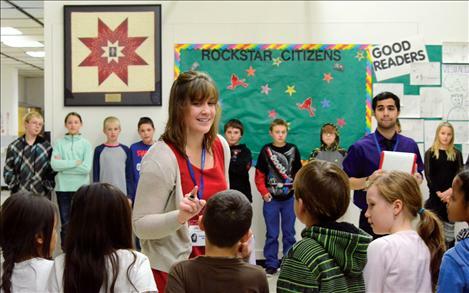 Emily Bradford of Missoula Children's Theater auditions students in Arlee. Sajada Lee and Jace Matt play crocodiles in the MCT play in Mission. 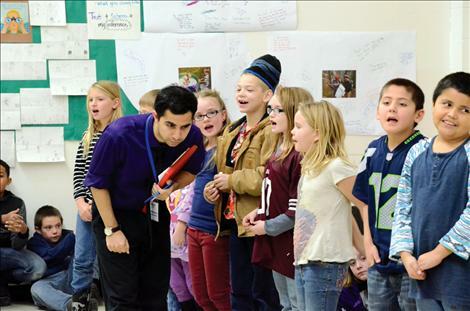 Local students perform with the Missoula Children’s Theatre. Sailor Prestin Teigen practiced all week memorizing his lines. Two teams of Missoula Children’s Theatre actors pulled into two different schools last week in red trucks full of costumes and stage props to give children in all grade levels a chance to perform on the stage. But only about 60 costumes fit in those trucks, and in Arlee 80 plus students auditioned for parts in the Wizard of Oz. During the audition, students lined up by height in a large square. The process started out with each student saying their name and age like they won a trip to Disneyland. Tour director Emily Bradford showed exactly what they were looking for by demonstrating the difference between an exaggerated loud voice and a soft whisper. “It’s hard to hear the soft voice, isn’t it?” she said. For two hours, students took turns saying lines like, “Can I please have a pony,” singing “Row, Row, Row Your Boat” and remembering a step turn routine. “We are looking for people who can listen and follow directions because we only have five days to put this together,” Cartusciello said. Kelsey Harris, 17, is a senior this year. She performed in many plays over the years. She said without the Missoula Children’s Theatre she might have missed the opportunity to discover how much she likes acting. She likes it so much that she would like to go to college to study theater. 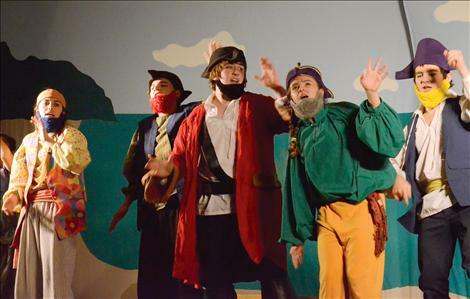 Up the road in St. Ignatius, the curtains opened with “Blackbeard the Pirate” on Friday night, with 63 students working to put the show on. Tour Director Emily Bradford explained how students memorized their lines. 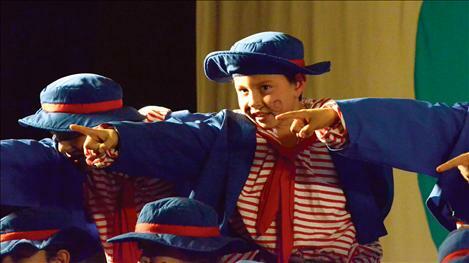 Being on stage does more than teach kids the meaning of stage fright. Prestin Teigen, 8, played the part of a sailor. He explained how he remembers the lines. “I thought of it when I was sleeping,” he said. Addison Arlint, 12, was a beach bum dressed in a Hawaiian shirt. Tour Director Mary Kate McLaurine explained to the audience after the show that the Missoula Children’s Theatre is an international tour project that travels to 50 states, and has for the past 40 years. In just this year, tour directors will work with 65,000 children in 1,200 communities. Mission High School senior Lindsay Johnson played piano for the St. Ignatius production. Other students and their roles included Dana Goss-Dickie as Blackbeard, Kaleb Durglo as Redbeard, Israel Umphrey as Yellowbeard, Sydney Castor as Bluebeard, Tristan Adams as Greybeard, and Peachfuzz was Warren Castor. The beach bums included Breeze Clark, Tori Peterson, Leila Marsh, Addison Arlint, JoLynn Girsch and Jillian Norton. Sailors were Connor Durglo, Prestin Teigen, Damien Durglo, Taylen Voice, Jason Brown, Kason Page, Alexis Glover, Nick Frost and DaShaunDre Steele. 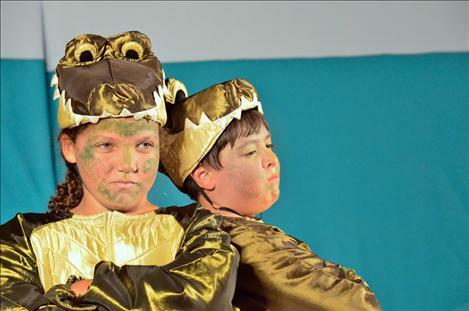 Sydney Brander, Xanian Lee, Ahni Umphrey, Dylan Schock, Athena Sasser and Cassidy Orr played the part of crabs, and Sajada Lee and Jace Matt were crocodiles. The mermaids included Lena Stamin, Sierra Girsch, Leslie Bennett, Amelia Cronk, Allison Umphrey, Paisley Couture, Natalie Helser, Livana Sasser, Laney Keast, and Emily Morigeau. The seaweed creatures were Izabel Evans, Maysa Couture, Brynn Pule and Madyson Esslinger. The parrots were played by Abbie Orr, Kanana Couture, Saellah Huggs, Aliya Fyant, Lola Schock, Lailla Durglo, Ashlyn Meyer, Anna Cronk, Avia Lee, Brooklyn McClure, Ananna Robine, Judea Azure, Jack Keast, Jake Helser, Sawyer Pule and Lex LaFrombois. Keisha Dillard was Sam the Clam and an assistant director. Other assistant directors were Kellen McClure and Justin Brown. Tour Director Emily Bradford was Jolly Rodger. In the Arlee production of The Wizard of Oz featured Megan Shick as Dorothy, Darren Marks as the Lion, Peyton Lammerding as the Tin Man and Noah Coulson as Toto. Also featured were Dalton Marks as the Professor/Wizard, Kelsey Harris as Glinda and Taylor Lammerding as the Wicked Witch. Elizabeth Morigeau played the Green Guard, Kameron Rubel was Major Munchkin and Charley Crawford played Farmer Munchkin. To complete the ensemble, Elina Moore, Harli Kinney, Belen Holtz, Natalie Coulson, Michelle Jury, Princess Bolen, Kolby Belcourt, Kat Coates, Drew Knoll, Bridger Smith, Mila Baldwin and Reece SpottedEagle appeared as the Winkies; Natalie Yocum, Carolina Buck, Saige Koetter, Kaylee Samsel, Errin BigCrane, Shelby Smith, Dean Greenwood, Tyler Brown, Mandy Couture and Jonas Paul as Magicians; Cheyenne Pablo, Maddie Yocum, Melaia Matt, Frankie Wright, Rylee Belcourt, Xaria Jacobson, Tucker Brown, Kyleah Brazill, Loretta Vollin, Kaylie Scott Raven Parson and Sophia Forgey as Munchkins; and Naomi Fish, Danika Jury, Aaliyah Tucker, Lilybele Buffalo, Aurora Parker, Audrina Gopher, Stephen Abu, Jack McVicker, Agnes Fleischuer, LilyAni Howard, Eli O’Neill, Madison Hanken, Rhea Abu, Moses Curtis, Tristan Fiddler, and Cayden Clark as Fierce and Ferocious Flowers. Assistant directors were Ashley Potts, Skyler Vernon, Autumn Moran and Madison Lahaye.